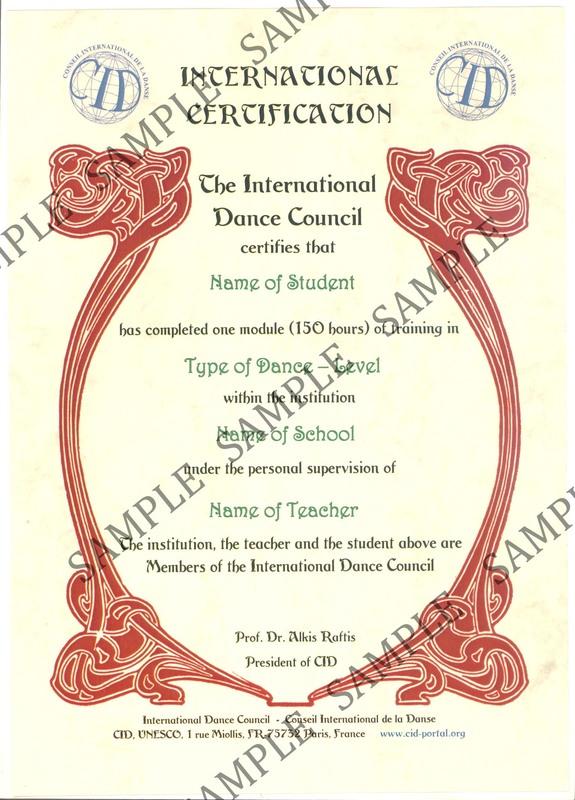 The International Dance Council CID, official partner of UNESCO, validates teaching by offering FREE OF CHARGE to its Members the International Certification of Dance Studies. 1. Each level is 150 hours of instruction. 2. The school, the teacher and the student are Members of CID. 3. The school sends to CID a declaration that the student has completed 150 hours. 4. CID sends formal Certification on parchment paper, valid world-wide. An official hands parchment to the student at a special ceremony. 5. After Level 1 the student can proceed to Level 2 (another 150 hours) then another 150 hours for Level 3, according to the requirements of the school. 6. This applies to all countries, all forms of dance. 7. It is free of charge, like all services provided by CID. – Uniformity: system is the same for all countries. – Verification: inquiries on certified students are confirmed by CID. 1. The teacher or director of the school is admitted to CID as Member. 2. The school is admitted to CID as Member, nominated by the teacher. 3. The teacher sends a filled a form for each student having completed 150 hours. 4. The students are admitted to CID as Student Members, nominated by the teacher. 5. The Executive Secretariat of CID sends to the school International Certification. 6. The School Director or an important personality of the city hands parchment to the students at a special ceremony. 7. A student can continue for another 150 hours, for example: Ballet Level 5, Tango Level 2, Dance Therapy Level 3. 1 hour a week x 38 weeks = 38 hours a year, that is a Level in 4 years. 9. Total cost is only membership fees: for teacher + for school + for each student’s membership. Certification is free of charge. Please return this form after filling it for each student/dancer you nominate for International Certification of Dance Studies. – Total cost is only membership fees: for the teacher + for the school + for each student. Certification is free of charge. – Data in bold characters above will be printed in English on the Certification parchment. Make sure the spelling is correct. – Type of dance must be one only, for example: ballet or tango or ballroom or dance therapy etc., in English. – Level must be a number, that is 1 or 2 or 3. Each level is 150 hours. No more than one Certification in a year. – Documents are sent to the school, not to students. – We are not familiar with foreign names. Better write family name in capital letters.Given name(s) before family name(s). Full name as on identity card. – Full postal address, email address, phone numbers. – Kind of dance, such as Ballet, Bharatanatyam, Ballroom, Belly etc. Use internationally accepted terms. – Level is always a number: 1 or 2 or 3 …. A level corresponds to at least 150 hours of instruction, rehearsal or performance.Level can be up to 10. – Year of birth (under 25 years of age membership fee is lower). – For minors data can remain confidential upon request (not appear online). even if the student has done more than 150 hours that year. A student can have two Certifications in a year if he/she has done 150 hours in each kind of dance. must be short, no more than four words. Official name only. Must be short, no more than four words. There can be two teachers if both are CID Members and the two names are not too long. The School Director can decide not to award Certification to a student even if the student has completed 150 hours. The School Director can ask students to pass an examination for that level or follow additional classes (theory, Anatomy, Dance History etc.). Minimum age for International Certification is 10, the student should be at least 10 years of age the day of the awarding ceremony. There is no maximum age limit. Certification means that the student has taken 150 hours of classes in the same school with the same teacher. All three must be CID Members at the time the certificate is printed. There cannot be two schools for the same Level. The 150 hours can include hours of class, training, performances, theoretical lectures, examinations etc. It is the School Director who decides. We do not check if the 150 hours were actually done or how they are done, we trust the School Director. She fills the form and sends it to us. We do not send documents to students, we communicate with School Directors only. There is no CID program of teaching, every school has its own program. We do not check the content of teaching or of examinations required by the school. The School Director remains entirely responsible for the quality of instruction and the accuracy of information provided. Procedure is the same: the teacher should ask her own teacher and school to certify her. Certification does not imply ability to teach. CID International Certification is not meant to replace other qualifications (diplomas, certificates, licenses etc.) whether local or national. It can be awarded additionally to facilitate uniformity on international level. Other qualifications are inevitably local since they are issued by national organizations. You can also certify former students, who have left your school years ago, provided they have had 150 or more hours with you. This might bring them back to the school for another Level. People often confuse certificate with certification. A certificate is document given by one party to another, for example from a school to its students. 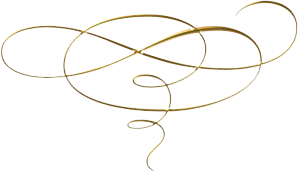 Certification is given by a third party, that is an independent organization. It confirms or validates a fact declared by the school. Beware of private businesses disguised as dance organizations selling titles such as degrees, teacher diplomas, championships, certificates, competition prizes, tests etc. at events they organize. Such documents have no value outside their own small circle. Dance is an art, there are no restrictions on who can teach an art (fortunately!). Teaching dance is open to all, same as practicing dance. Teaching certifications are useful as a way to inform the public about a teacher, but they are not legally binding.